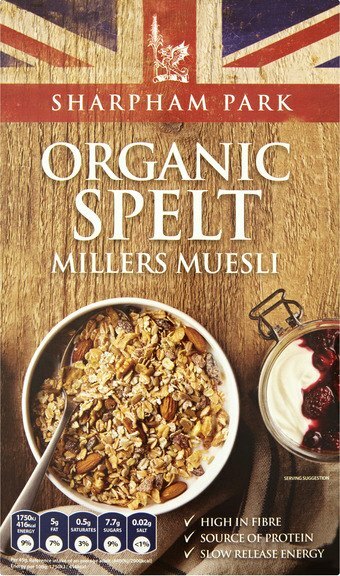 Start your day with our Organic Spelt Millers Muesli, a mixture of all things yummy. The spelt’s distinctive nutty almost, malty sweetness is enhanced by the raisins, dates and apricots and the combination of walnuts, almonds and sunflower seeds add a delicious crunchy texture – and did we say it’s organic! Sharpham Park Toasted Spelt Flakes 26%, Organic Raisins 16%, Organic Jumbo Oats 16%, Sunflower Seeds 15%, Barley Flakes 15%, Organic Chopped Dates 3%, Organic Apricots 3%, Organic Walnuts 3%, Organic Almonds 3%.